I decided to get all bloggy and change the marchdecember design. Now it's so original copied and stuff. Jennifer and I ought to actually update more... maybe. 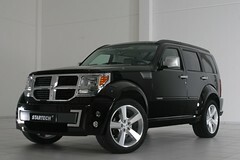 It turns out photos don't do the Dodge Nitro justice. It's actually a very nice looking vehicle. If I wanted a Jeep Liberty with a cross-hair grill, I could buy one and even use my same license plate. That would be cool. This page contains all entries posted to marchdecember in January 2007. They are listed from oldest to newest.